How Will Gold React To The Next Stock Market Crash? From Streetwise Reports: Sector expert Michael Ballanger explores the impacts of several historic market crashes. Q: How do you get your broker out of a tree? It was 31 years ago, on Oct. 19, that I watched a $300,000 stock portfolio begin to vaporize, with a Monday loss of 35% morphing into a 93% amputation by the end of the week, the remaining cash balance totaling slightly over $16,000. The $125,000 margin debt had to be cleared when the highly diversified portfolio of gold and silver stocks ignored the $80/ounce advance in gold prices that week and decided instead to behave as “stocks” rather than “gold,” proceeding to plunge in a wave of pure panic the likes of which had not been experienced since fifty-eight years prior. I recall staying at the office most of the evening talking to my devastated clients, trying my utmost to calm them, to reassure them, to convince them that stocks were far superior to real estate or bonds or money-in-the-bank, but with the 23% loss in the Dow Industrials, it was all in vain. They wanted out and they wanted a check and they never wanted to hear any of it. It was the most emotionally draining moment of my life, with a close second being 10 years later, when the now-infamous Bre-X Fraud was revealed, resulting in a similar crash in Canadian stocks the very next morning. I bring up the topic of the Crash of ’87 only because of the incredible impact it had on the psyches of millions of investors around the world. Forgotten is the fact that, a little over two years later, the Dow Jones Industrial Average broke out to all-time highs as the baby boom generation finally forgot about love beads and VW vans and fell wildly in love with capitalism–and, of course, stocks. What followed was the era of the disinflationary ’90s and the revolutionary arrival of the Internet, led by market darling America Online, whose January 2000 merger with Time Warner marked the pricking of the biggest market bubble in history. Then, eight years later, after a half-decade of uproarious lending policies had driven the banks to bubble territory, another Crash arrived–only this time greeted with a massive rescue effort by the central banks and treasury departments of almost every nation on the planet. Ten wondrous market years (and some $14 trillion of credit creation) later, here we are in the autumn of 2018, with stocks ahead over tenfold from the lofty peak of the Summer of ’87, when the Dow hit 2,722. 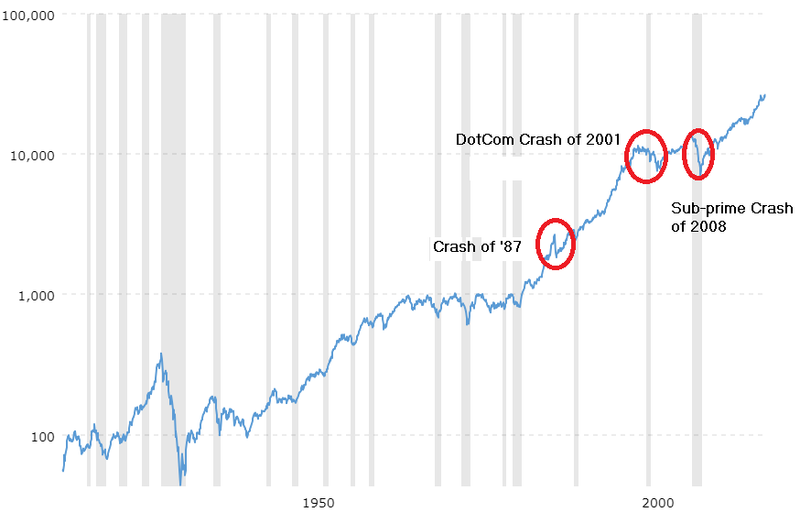 While the chart below would suggest it was a relatively minor event, the Crash of ’87 will be indelibly etched into my personal memories in the same way as the Kennedy assassination and the lunar landing–we all know where we were when it happened. There has been a great deal of discussion in the financial blogosphere about the future course of the stock markets around the world, and while it is pretty obvious that the technical picture is clouded at best, it is important everyone remembers what constitutes the glue that is keeping the market from shattering into a thousand molecules. It is faith. Faith in the Fed that “has our backs”; faith that the economy is “incredibly strong”; faith in our leaders who are friendly to the stock markets; faith in the fact that long-term ownership of common stocks has been a reliable strategy (see chart). It is faith in the certainty of “favorable outcomes” that has so many people forging through life anchored to the notion that the two main assets that “always recover” are housing and stocks. It was Ronald Reagan who decided to create an entity called “The Working Group on Capital Markets” through Executive Order 12631 in March 1988, a mere six months after the ’87 Crash. As omnipotent as that may have appeared at the time, the group was nonetheless powerless to stop the Asian Crisis of 1998, and the two crashes mentioned earlier. So when I see stick-save recoveries like we saw last week, first in the U.S. and on Friday in Beijing, the reality is political leaders realize stock markets are now bellwethers for legacy control, and no leader, whether it is Trump, or Putin, or Xi Jinping, wants to go down in history as the leader who ruled while his country’s stock market collapsed. So when I am asked if one should “Buy the Dip” currently seen in the vast majority of global merket averages, I say “Yes,” only because those that have adhered to the notion have prospered far more than the fear-mongers that peddle mayhem. This COT represented a return to normalcy as the totally insane “pile-on” shorting by the algobots since July was totally rebuffed by the big rally earlier in October. The volume on the $34 Thursday pop was about 10 times normal volume, which completely explains the massive swing that occurred between the Large Specs (“algos”) and the Commercials (“bullion bank behemoths”), whereby the (Large Spec) software ordered the position be covered only because it was moving against it. No rhyme; no reason; no reality. Now, and this is important, if the Commercials have been successful in turning the Large Specs into “pile-on” buyers after being serial sellers since June, chances are they are now serial “pile-on” buyers until the positions once again revert to the extremes of late 2016, where Commercials were massively short against the Large (algo) Specs’ massive longs. While I warned of a short squeeze a few weeks ago, we actually got it Oct. 11, but the exciting part is that it might just be a “long hissing fuse” type of squeeze that takes until February to unwind, all in favor of those that are long. 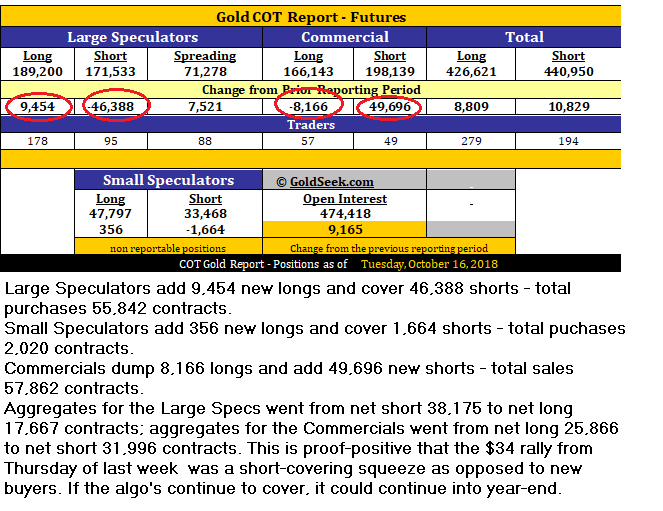 As I have opined for most of 2018, I believe gold stands a realistic shot at a close north of $1,400 before New Year’s Day, but we want to see the Commercials get out of the way and let the velocity of the short covering frenzy accelerate, which they certainly did not allow in COT week ended Tuesday, Oct. 16. Mind you, they were moving from an historically bullish position, one not seen since the dark days of 2002, when gold resided under $300. By moving back to their normalized net short position, they simply covered all of the sub-$1,200 per ounce acquisitions and by doing so, cemented the $1,167 bottom from Aug. 16. I eagerly await the arrival of trading this week, as we are headed into both tax-loss season and the best two weeks of the year for buying stocks beaten down by October’s weakness. Despite the technical damage caused by the global selloffs, the rich and powerful like markets that appease the masses, and therein lies my bullish bias and my cynicism. The SPDR Gold Trust ETF (GLD) fell $0.32 (-0.27%) in premarket trading Monday. Year-to-date, GLD has declined -5.56%, versus a -0.17% rise in the benchmark S&P 500 index during the same period. This article is brought to you courtesy of Streetwise Reports.